With three different levels included, this fun Thanksgiving Journal pack is perfect for your special education class. 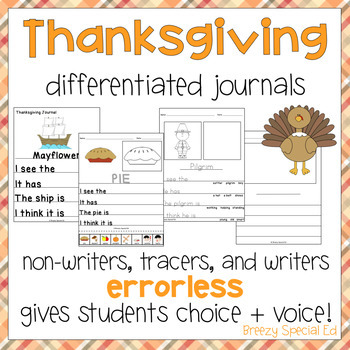 It's already differentiated for all of your students, including non-writers, emerging writers, and writers! This journal prompt pack is about all things related to Thanksgiving/Fall time, including a turkey, apples, pilgrims, and more! There are 10 leveled journals included, enough to get you through 2 full weeks if you do a journal each day. 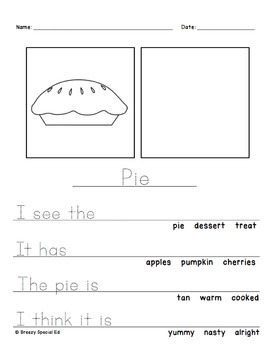 • Level 1 students can color in the picture, trace the title, and cut and paste symbols (with or without aide support) to complete the sentence with their thoughts. 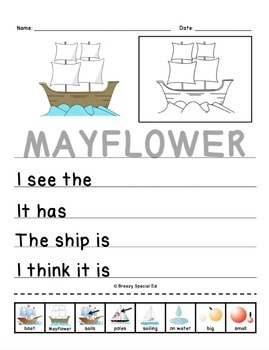 • Level 2 students "Tracers" can color in the picture, draw their own, trace the title and sentence starters and finish the thought by circling and/or writing one of the 3 choices on their paper. I'm so excited to have one journal product that meets the needs of all of my emerging learners. 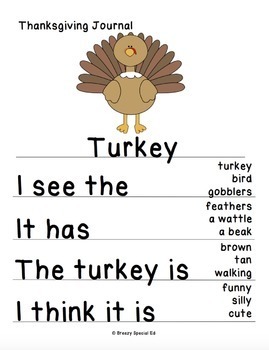 I use this with my high school class, but it would be appropriate for early learners of any age. I hope you find this helpful as well. ✯Did you know you get credits that save you money on future purchases when you leave feedback?! Go to your My Purchases page. Beside each purchase you'll see a Provide Feedback button. After selecting that button you will be taken to a page where you can give a rating and leave a comment for the product. I really appreciate your feedback as it helps me know what products are most helpful for your classroom! Plus, you then can get free products or at least a discount!